1 You go out your back door and see a tiny, shiny trail on the ground. What animal made that? It was most likely made by a snail or slug. Snails and slugs are mollusks. These are animals with soft bodies. They are also invertebrates, a group of animals that do not have a backbone. 2 Snails and slugs have long, moist bodies. Some snails live on land. Some live in freshwater. Some snails live in the ocean. Slugs, too, live on land and in water. A land snail that you might see in your yard has a coiled shell on its back. 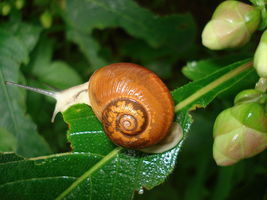 A snail can pull its body into its shell. Slugs are like snails without shells. 3 Snails and slugs move by creeping on a false "foot," or pseudopod (SUE-duh-pod), on the bottom of their bodies. Their bodies make mucous or "slime." It comes out in front of the pseudopod. It makes a slippery, moist track for the snail to move along. When the slime track dries, it makes that shiny trail you might see at your house.